This complex house on a difficult site of trees and stone ledges is known for its simple lines, serene views and beautiful craftsmanship. O'Neil Ford, at his best, designed this home with Texas materials, hand carving and the continuation of a folk quality that permeates his homes. A sense of refinement comes from the precision of the intricate craftsmanship, interlocking spaces and buildings that create a compound - a residence as an architectural village, a Texas house for Texas art. 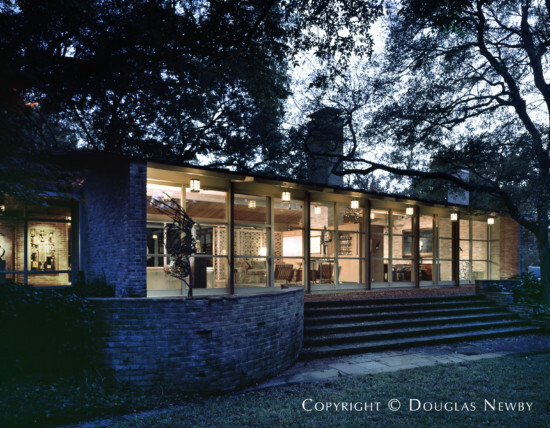 O'Neil Ford and the lineage of architects that worked under him were a part of the firm he founded and are responsible for 75 years of architecturally significant Texas modern homes. You can see his influence in the work of Frank Welch of Dallas, and Lake/Flato in San Antonio who recently earned the National AFA award.